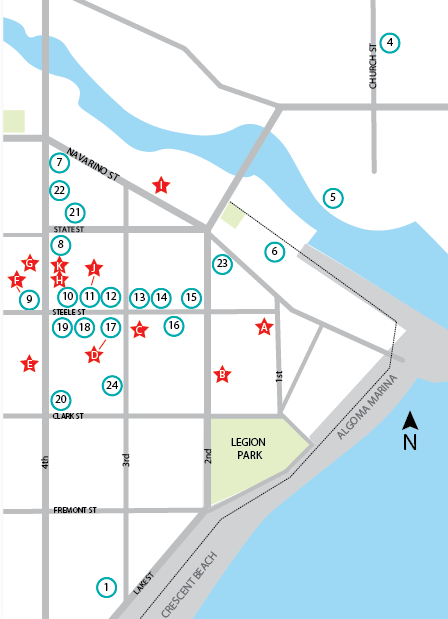 The robust history of Algoma is still very evident today and can be seen just by taking a stroll through town. Take the Historic Algoma Walking tour at your own pace and learn about the gorgeous Victorian-style homes to hotels then and now and everything in between. Take in the beautiful Walldog murals seen on some of the buildings that capture the essence of yesteryear including Kodan Feed Store, Reinhart Bros Shoes and Ahnapee & Western Railroad, just to name a few. 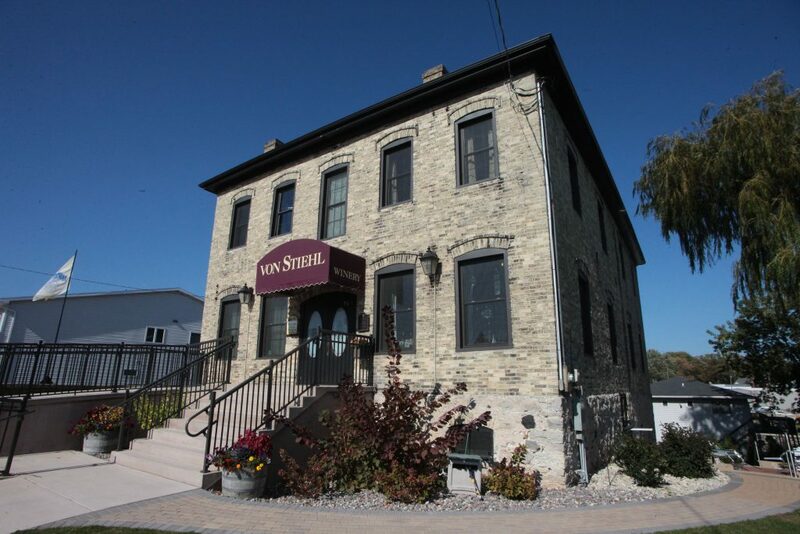 Von Stiehl is much more than a tasting room, with a 10,000 square foot production facility and three underground cellars in a building listed on the National Register of Historic Places. The winery annually produces over 80,000 gallons of wine. Take a tour to see how a production winery operates. 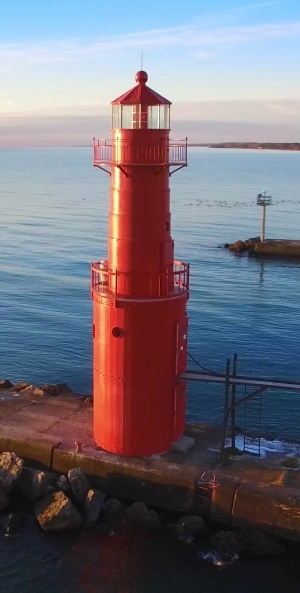 Afterwards, have a glass of wine on the three-tier terrace overlooking the Algoma lighthouse and waters of Lake Michigan or enjoy your wine in the top floor lounge. Open year-round, 7 days a week! The first lighthouse was a square, pyramidal wooden tower painted white, surmounted by a black, hexagonal iron lantern. The upper part was enclosed for a watch room. This lighthouse did not have a fog horn until 1910. It had a fixed red lens lantern illuminating toward the lake. The light was operated manually twice daily. Ole Hansen was the first keeper of the light in 1893. In 1896 Charles E, Young took over and Young was relieved by Nelson Knudsen in 1899. Justavus Umberham became the keeper in 1901. A fog signal was installed in 1910 when Louis R. Braemer was appointed first assistant. Those first sailors must have had some frustrating times finding the harbor on extreme foggy days before the fog horn came in use. Braemer stayed on until 1939. Eugene Kimball was appointed keeper in 1913, C.J. Graan, 1923 and E.C. Anderson in 1938. Since 1938 the U.S. Coast Guard by decree from the President of the United States operates all light hours. 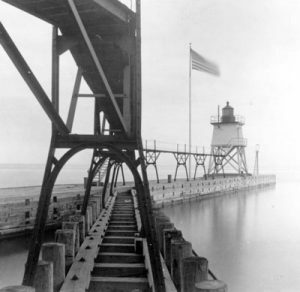 Between 1930 and 1932, the cutting down and repair of the North Pier and light tower was completed. It cost about 100,000 dollars. The present lighthouse is still in operation. The steel tower lighthouse came from Muskegon, Michigan; the rock came from Sturgeon Bay; and sand came from Green Island. The work needed 50 men (half of them were from Algoma). General Douglas MacArthur helped design the pier as an engineer. Since 1932, the same lighthouse and pier have not changed much. In 1973, the Coast Guard automated the lights and later a civilian was employed to operate the fog signal when needed. In 1974, an automatic green light was placed on the South Pier head. Now all lights operate 24 hours a day and the fog horn goes on automatically when needed. As far as records have been kept, there has been no known tragedies involved with the lighthouse.